The conceit is fairly common; an old, grizzled, sergeant-type takes charge of a group of green newbies and turns them into an effective fighting unit. Quite often it’s in live combat; while the newbies have refused to listen before, as things get desperate the newbies do exactly what the old sergeant says – and he semi-miraculously pulls them through. Shortly thereafter the old sergeant is the respected NCO leader of a crack team. Of course, next he or she usually dies rescuing a couple of the team members who thought that they now knew better than the old Sarge did, and the group becomes even more effective as they go on to avenge him or her, and eventually (often in a tag scene) one of them becomes a grizzled old sergeant themselves – but that’s the way the plot goes. Most movies and novels are realistic enough to indicate that there’s a fairly long period between the sergeant taking charge and everyone being fully-trained; they just skip over the training period because it’s boring. The trouble with the notion in RPG’s is threefold. First up, in RPG terms, learning through training is usually impossibly slow compared to the pace of the action. Secondarily, if a simple sergeant can turn green newbies into a truly effective team, what are the player characters needed for? Finally, any kind of long-term combat bonus which can be acquired during downtime tends to translate – at least in a RPG – into a “must-have free bennie” that the players will have their characters grab for at every opportunity until they get it, and will then forget all about except as another bonus on their character sheet. Ergo, what we’ll want in RPG terms is a way in which a more experienced character can give greenhorns a quick temporary boost without “magic” and (possibly) a way in which his or her leadership can enhance more powerful characters – but only while the user is around. There are several ways to do that in Eclipse. Arith Lewauken uses a combination of Assistant, Reflex Training and Blessing to, effectively, give each of his nearby allies a large bonus on any one skill, attack, or attribute check roll per round – provided that he’s taken a round out to give directions within the last 2d4 rounds. The Battle Sage, over on Christopher West’s blog uses Presence to grant those nearby the Legionary feat – an elegant and simple solution. A Mystic Artist – most likely using something like Diplomacy or Oratory and specializing in giving commands in battle – can be reasonably effective quite cheaply, although this is more a matter of inspiring leadership and shouting orders than of having any actual tactical skills. For example, an aspiring priest might focus on Knowledge/Religion to chant inspiring tales of the faith and invoke the favor of his or her god – inspiring and enhancing his or her companions. A high-level character using the Executive ability can grant substantial bonuses to entire legions of followers – although this is getting into high command positions rather than the art of small unit leadership. Immunity/the restriction that martial arts only work with specific weapons (Very Common, Minor, Major), Specialized and Corrupted for Reduced Cost / only works with a specific martial arts style, the style cannot have any mystical effects (4 CP). Double-Advanced Blessing / the user may share abilities with up to (Charisma) other nearby (within 60′) individuals in addition to himself at any one time. Specialized and Corrupted / only works for a specific martial arts style and any immunities related to it, the style cannot have any mystical effects, only works as long as the user can continue to offer advice. There. That will let Sarge share the benefits of some of his experience with greenhorns – and even advanced characters who don’t have a martial art of their own that they’d prefer to use – nearby. If Sarge happens to have a total of +11 in his or her Command Martial Art Style, he or she might bestow six martial abilities – perhaps +2 to Attacks, +2 to Armor Class, Combat Reflexes, and a good chance to avoid surprise (Mind Like Moon) – on everyone he or she is coaching. That’s well worth 10 CP and investing some skill points in a martial art. You may have to talk fast to get it by your game master though; after all, natural-law Immunities, and Blessing, are both special-permission only abilities – and for good reason; they can be used to produce extremely powerful effects, just like this one. Fortunately, abilities bestowed by “blessing” don’t stack with existing abilities – so this martial art won’t stack with another. Immunity/the inability to use more than one martial art at a time (Very Common, Minor, Major), Specialized / only works with a specific martial arts style (6 CP). Yes, that’s yet ANOTHER natural-law immunity, and a far more dubious one. Allowing an entire group of characters to stack two martial arts can easily result in massive, cheap, bonuses. Still, if you let someone get away with it, that 16 CP and some skill points will make the user an indispensable part of any combat team – even if that puts them just a bit behind the people who have focused exclusively on building up their own combat abilities. There’s a knack to keeping your head down, to taking the shot you’ve got instead of waiting for a better one, to knowing what’s got to be done and when to avoid volunteering like it was an invitation to be shot – which it often is. You want to know how to use whatever cover you can get, when to pop up to take a shot, and how to sleep on your feet with one eye half open. These are the ruthless moves and tactics that – with a good dose of luck – kept you alive, when so many of the other young, green, troops died in their first few battles. This isn’t a particularly formal martial art. It doesn’t have any fancy requirements besides making it through few your first few mass battles. By that point, you’re a seasoned veteran – or you’re dead. Requires: Surviving at least three mass battles. Basic Techniques: Attack 4, Defenses 4, Synergy/Survival, Synergy/Hide (or Stealth), Synergy/Heal, and Toughness 2. 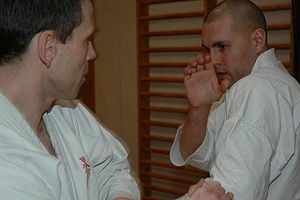 Advanced and Master Techniques: Combat Reflexes, Mind Like Moon, Weapon Kata (either unarmed if first taken with a primary military weapon or with the user’s primary military weapon if first taken as an unarmed technique), and Weapon Kata (with a secondary military weapon). Note that – if this art is used in conjunction with the immunities and blessing abilities noted above, the user can skip the Weapon Kata – and will max out the techniques of this style when he or she reaches a total of +29. Given that – at that point – the user will be granting everyone in his party including himself or herself a +4 to attacks, +4 to AC, +2 to Survival, Hide, and Heal, Combat Reflexes, a save against surprise, and DR 2/-, that’s probably well worthwhile.